We offer many different real estate signs and stands as shown below. Custom die cut shaped signs are available as screen printed and full color corrugated yard signs. Great for long-term outdoor use. Contact us for pricing. 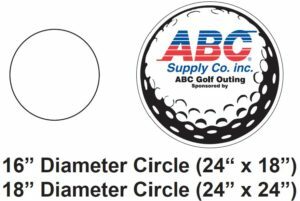 Custom die cut circle signs are available in two sizes: 16″ round and 18″ round. 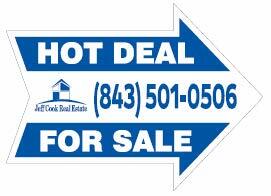 For other real estate advertising products, click Real Estate Signs. For other plastic yard signs, click Yard Signs. Printed on durable, corrugated, plastic material, these cheap lawn signs are guaranteed to last at least two years! Shipping: Contact us for actual prices. You must pay the artwork fee before we begin working on the artwork proof. All other costs are due before the signs are printed. For assistance, call us at 321-253-0424 or e-mail us at tencommandmentsigns@yahoo.com. 50 is the normal minimum order for the regular realtor frames of “Economy” and “Deluxe”. Political candidates typically use “Political” wire stands in large volumes as you see in your local area. 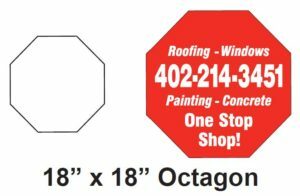 These are for displaying a temporary sign not commonly used by Realtors. Minimum order is 50. This is the standard political wire stand found every where. See our “Political” wire frames here. Realtors prefer the “Economy” real estate frame. The base is thick, heavy 1/4 inch gauge steel rods that resist bending and very durable. The upper portion is standard 9 gauge steel to handle the standard coroplastic signs and is 10 inches wide and 30 inches tall. The base is made from a thicker steel 1/4 inch. See diagram above. The base wire frame is about twice the size of the wire frame of a standard political wire stand that are in your neighborhood. Very sturdy and strong. Resistant to heavy winds. See diagram above. The “Economy” version is our high volume best selling steel frame for realtors. They will endure for months and will not bend under heavy winds. Minimum order is 50. Highly Recommended. Good quality best value, and our best seller. The “Deluxe” realtor sign steel frames are also made from heavy strong 1/4 steel (3 gauge) and do a better job standing the test of time. Main difference is the width, 18.5 extra wide, and is 27 inches tall. Minimum order is 10. These frames are non-galvanized; if you need galvanized, please contact us. A wonderful alternative to “H” wire stands, these plastic sign stands are made from high density plastic, reinforced with fiberglass and manufactured with a minimum of 90% recycled materials. 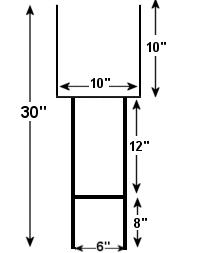 The design of these stakes allows them to flex under wind load. 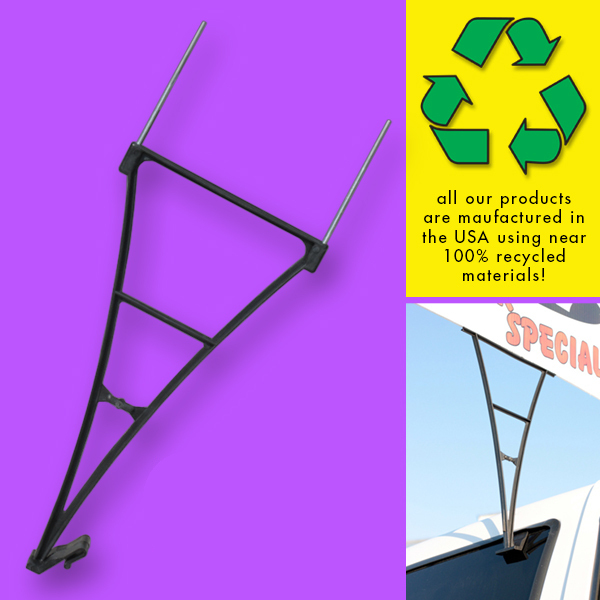 Plastic Stakes have a simple, arched design incorporating a step for ease of installation. These plastic sign stands won’t rust, have no sharp edges and no oil which is sometimes found on H wires. 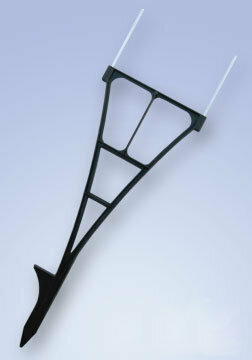 Plastic stakes are a “green” alternative to conventional steel wire stakes and cost less to ship. Available in black only. Minimum order is 50 stakes and shipped in multiples of 50. Durable and will last for years. These Window Clip Sign Holders easily slide onto most any car or truck window. Small signs size 12×18 Sign Company Click here for inexpensive prices on small signs. 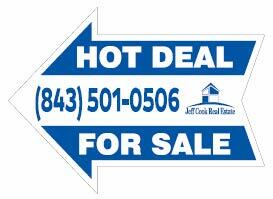 Our high quality plastic Realtor yard signs normally last 3 years in southern climates. The frames or wire stands of sign styles listed on the previous page will be more durable in holding up to high winds. Our cheap price guarantee on plastic real estate signs is cheaper than the internet competition.